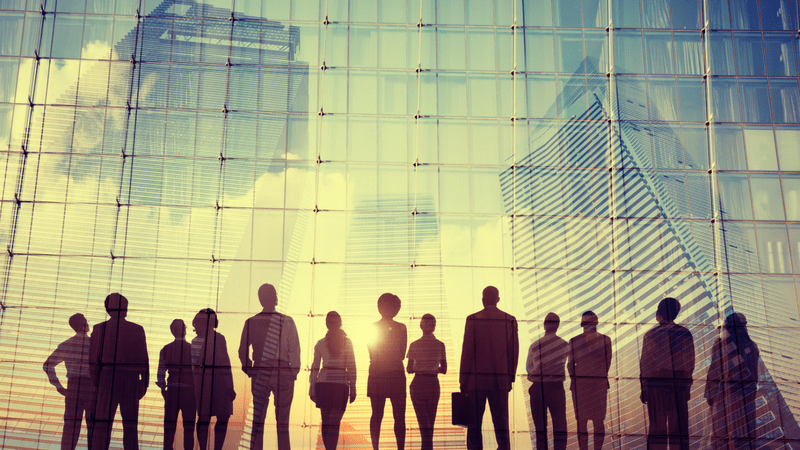 The startup community is quite familiar with how to use venture capital to grow a company, but many first-time founders aren't as familiar with venture debt. 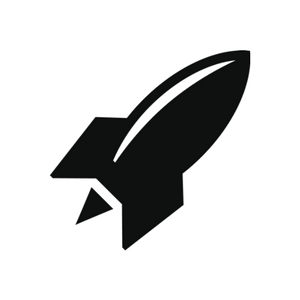 Spinta Capital co-founders, Todd Schneider and Austin Dean, recently taught a workshop at RocketSpace on when and how to use venture debt to fuel startup growth. Their firm focuses on helping emerging growth companies raise debt capital, and they've worked with clients that typically are looking to raise $5-50 million in capital to finance everything from working capital to equipment and growth. For founders considering venture debt as a financing option, here's a look at the basics of venture debt, including when — and when not — to use it. Venture debt is a loan and is usually made to a pre-profit or recently-profitable emerging company, typically one that has underlying intellectual property or technology behind it. Unlike venture capital, investors — which could be banks, private specialty funds, hedge funds, or publicly-traded Business Development Companies (BDC) — structure deals as term loans (or lines of credit), usually with warrants (purchase rights) for company stock. 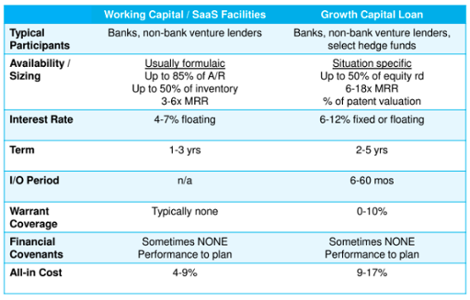 Venture debt can be seen as a replacement for or a complement to equity financing. According to Spinta Capital's research, about $6-8 billion of venture debt investments are made annually. By comparison, $40-60 billion in venture equity deals are made annually. What Makes a Company Debt-worthy? Many high-tech companies — including Spotify, Uber, Trulia, Facebook, Etsy, DocuSign, and Google — have used venture debt to finance various stages of their growth. The Spinta crew says that venture debt is often best for companies that are revenue-generating and typically no more than 18 months out from break-even. Venture debt can also play a supportive financing role in early stage (and even pre-revenue) companies who have recently raised an equity round, though companies at this stage must be extra careful with sizing and structuring the loan prudently. When is Venture Debt a Bad Idea? In the end, the company will need to repay the loan, typically in one to three years. Any of the above circumstances could hinder the business's ability to pay back the loan or even to raise future equity rounds if the startup is caught up in financial turmoil as a result of a debt financing decision gone wrong. What Types of Loans Exist? Line of Credit: For debt structured as a line of credit, it's formula-based and tied to a percentage of the value of accounts receivable, monthly recurring revenue (MMR), or inventory. 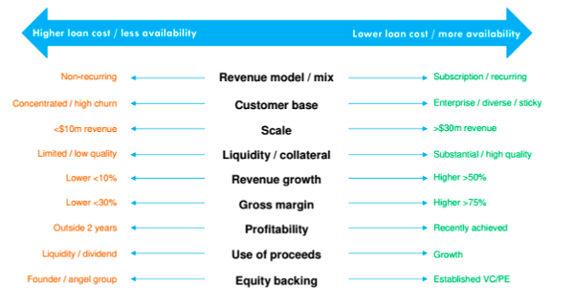 This is the lowest-cost form of loan, and it is available to revenue-stage companies. Companies can draw on or pay back this loan at their discretion with no fees, other than interest. 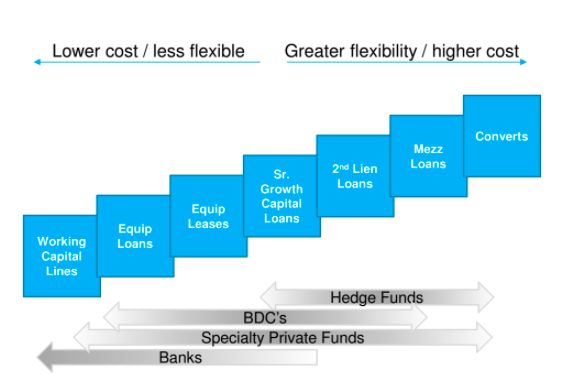 Growth Capital Term Loan: Debt structured as growth capital term loans can be advanced for any purpose—or they can be tied to specific equipment purchases. These loans can usually be structured to allow for flexible, future-draw periods so that the company doesn't have a large debt on its books when the full loan amount isn't urgently needed. Available to series A or later startups, as well as mid to late-stage bootstrapped companies, these loans set all assets as a blanket lien for collateral if for some reason the loan goes unpaid. With both structures, the loans may or may not be governed by financial covenants, which are conditions imposed by the lender to safeguard the financial health of the company and reduce the risk for the lender. If a covenant is tripped, the lender has the right to pull the loan. Spinta capital has created two helpful charts to navigate key terms and typical market rates. 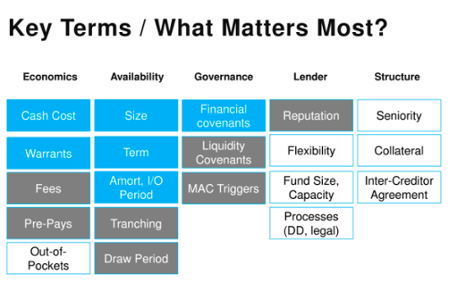 The first breaks terms down into five categories: economics, availability, governance, lender, and structure. Terms in blue are the most important to consider, while terms in gray are secondary considerations worthy of thought, and terms in white are tertiary factors of concern. Is Venture Debt Right for Your Tech Startup? For startups still on the fence about venture debt as an option, Spinta Capital has an ongoing blog about key issues, as well as nuanced arguments for and against venture debt as a financing instrument. 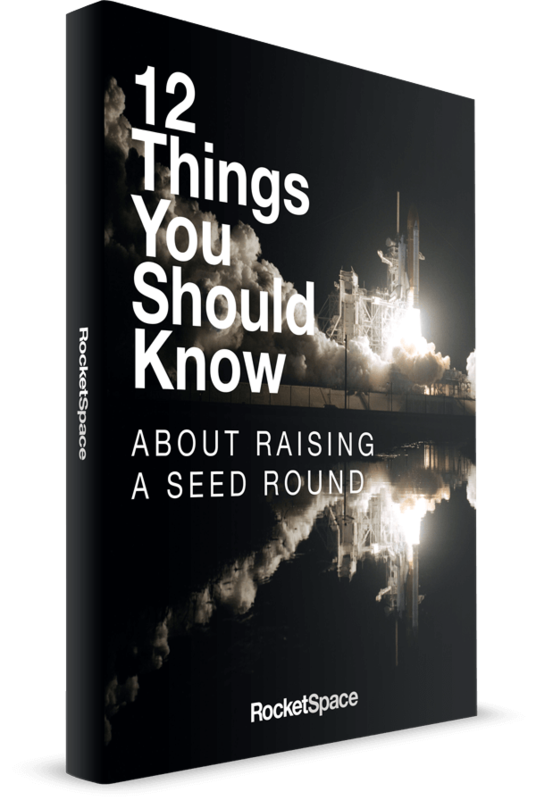 Additionally, members of RocketSpace's tech ecosystem are well-equipped to answer your questions regarding venture debt. Many of our members have "been there, done that" when it comes to securing a new funding round and scaling fast. All charts and graphs courtesy of Spinta Capital.